Chelsea boss Maurizio Sarri addressed the media in his Friday press conference and discussed the futures of Eden Hazard and Ruben Loftus-Cheek amongst other topics. The Blues are in action against Newcastle United on Sunday as the Italian tactician looks to make it three consecutive wins to start the Premier League campaign. Naturally, with more time he has to spend working with his squad, Chelsea will hope to improve and implement his preferred style of play better, and having Hazard back at full fitness will undoubtedly help with that process. 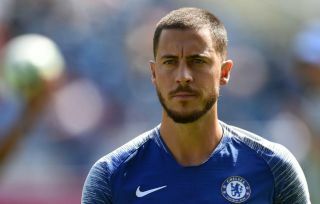 After returning later than many of his teammates from the World Cup having finished in third place with Belgium, Hazard has gradually been improving his fitness and Sarri has now suggested that he could be ready to start a game but won’t likely finish it. Perhaps of more importance though was Sarri’s comments on the 27-year-old’s future at the club, as although he sounds clear in his desire to keep his best players, there was a slight hint that Hazard will only leave if a suitable replacement was ready to come in. “I think so. I am the coach of a very good team. I am the coach of a very great club. It’s so important that such an important club cannot sell a very important player without the possibility to buy another very important player at the same level. Meanwhile, the 59-year-old also revealed that he has spoken with Loftus-Cheek about his future at Stamford Bridge too, with the youngster undoubtedly eager to kick on after impressing with Crystal Palace on loan last season and with England this past summer. Sarri has essentially suggested that the 22-year-old will remain with Chelsea until January at least, and the relevant parties will seemingly then sit down and discuss the best approach moving forward.